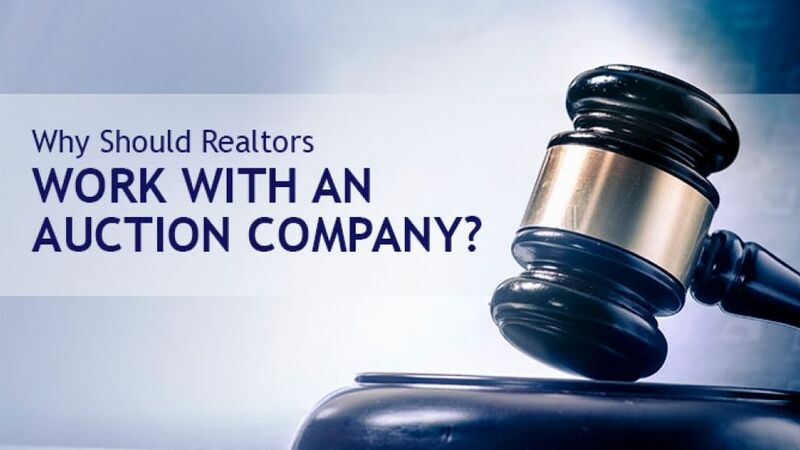 Why Should Realtors Work With an Auction Company? You might be familiar with an auction as an accelerated approach to selling property to the public. You might also be aware that auctions attract attention, expanding your network of buyers while also raising sales prices through a competitive bidding process. But these are only a few of the many reasons why real estate auctions are the sales model of the future. Broader market – Auction companies are skilled at marketing properties to potential buyers, ensuring a property stands out in the marketplace. Direct sales efforts help find qualified buyers at auctions, increasing the likelihood of a profitable sale. 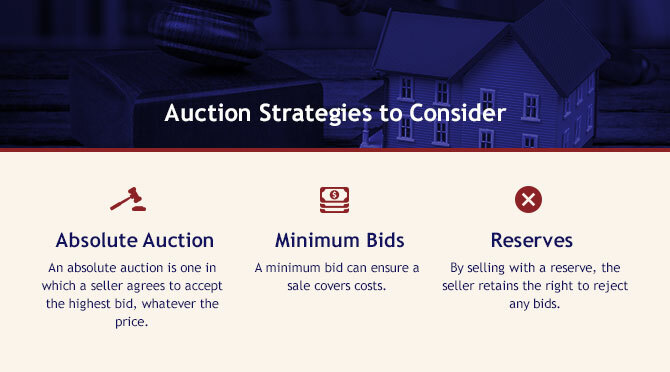 You can also include a number of properties in a single auction through combination bidding, minimizing the marketing expenses needed for separate auctions while further increasing your network of potential buyers. The increased visibility of the auction process can even attract interest in any of your non-auction properties. Commissions – There are opportunities to earn profits by 1) referring a broker or agent to an auction company, 2) registering a buyer who purchases property at an auction or 3) listing the property that sells at an auction. Eliminate uncertainty – An auction can eliminate pricing uncertainty by assuring the property will be sold at its fair market value. Increased revenue and market share – Developing a niche market with successful auctions will help generate referrals and return business. This, of course, translates to increased revenue. Reduced carrying costs – A longer sales process can involve considerable carrying costs, such as taxes and maintenance. By reducing the time frame of the process, your client can reduce the carrying costs of property maintenance and keep costs from chipping away at equity. Reduced timeframe – Real estate auctions can significantly reduce the timeframe for the sale process. Once the client sets the date for the auction and terms for closing, the process becomes much faster. This can be extremely helpful if your client has been struggling to sell the property for a while or if a quick sale is needed. In short, the seller determines the timetable so their home can sell more quickly at auction. Simplified negotiations – Because auctions set the terms and conditions of sale beforehand, there’s no longer a need for negotiation. With an auction, you can set the time and date of the sale, the timeframe for closing and the amount of earnest money deposits. Since buyers review the terms of the sale and come prepared to buy on those terms, there’s no seemingly endless back and forth. No Contingencies – Auction sales are not subject to financing, home inspections, surveys, radon testing, variances, etc. True market value – An auction will make it easier to sell your property at the true market value. Urgency – The format of an auction — fixed date and competitive bidding — fosters a sense of urgency for buyers, forcing them to complete due diligence and line up finances by a particular deadline. If buyers don’t want to miss out on an opportunity, they will make an effort to prepare. The alternative is a traditional process that can take months for everyone to firm up a mutual commitment. Global Market Platform – An online auction method allows you to accept bids from anyone on the floor while simultaneously accepting bids from anyone anywhere in the world. An auction simplifies what could be a tough sell, eliminating the likelihood that a property will remain unsold for a lengthy amount of time. If you think added visibility, coupled with a speedy process, might benefit your listings and give you an edge over the competition, then you should give real estate auctions serious consideration. Auctions are truly a win-win for everyone involved. When Are Properties Suited for Auction? Auctions are also suitable when the seller needs immediate cash, needs to liquidate an estate or is moving out of state. In addition, auctions can be well suited for a seller’s market, an emerging market, a dull market or a changing market. Helping the seller analyze the market and their needs to fully assess the auction benefits. Referring the seller to a professional real estate auction company. Replacing any sale listing agreement with an auction contract. Notifying the MLS that the property will be sold at public auction. Collecting a referral fee from the auction company upon closing. Calling auction companies to be added to their mailing lists. Attending real estate auctions to see how they work. Advertising as an agent or broker who understands how to sell property at an auction. Attending pre-auction open houses, as well as meeting and registering prospective buyers. Determining the market value of properties prior to auction. Learning how to earn a commission for registering a successful buyer. Learning the terms of the auction. Registering the bidder prior to auction and assist the bidder with auction strategy. Collecting the commission upon closing. If the bidder becomes the buyer, the cooperating broker or agent will be the one to accompany the buyer to the contract room as well. Canceling any sale listing agreement and replace it with an auction contract. Providing a fact sheet on the property, in addition to local licensing information. Securing a sign, photographs and keys for the property. Securing property maintenance and also supervising property management. Holding open houses for inspection. Helping bidders with the pre-qualification process. Providing progress reports to the seller. Helping the auctioneer with the bidding process. Accompanying the buyer to the contract room. Helping the buyer with post-auction inspections and financing. Assisting with any pre-closing events and will attend closing. Collecting the commission check upon closing. 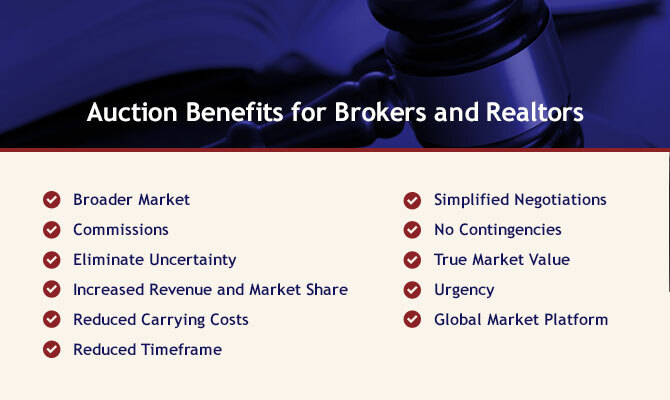 Auctions are basically a full-service shop that can generate a number of revenue opportunities for you and your brokerage firm. It’s important to choose the right auction type for a given property. This is why it’s a good idea to discuss the above alternatives with auction experts, before incorporating them into your contract. Before the auction process even begins, buyers will have access to an information packet, usually found online. If anyone is interested in participating in the auction, they will need a certified check for earnest money, which can vary between five and 20 percent. A facilitator begins proceedings by reviewing the rules. Lenders may be on hand to answer financing questions. A presentation may show images of the property while listing key facts. An auctioneer begins the bidding process, with potential bidders indicating an interest by lifting a numbered paddle. When only one bidder remains, the auctioneer can announce the sale of the property. The contract and paperwork can be handled on site. Closing typically occurs within 20 to 45 days of the auction. Real estate auction firms like Fortna Auctioneers & Marketing Group have the expertise to guide you through the auction process for a quick and successful sale. The success of an auction depends on a well-planned, aggressive marketing campaign targeting likely buyers. This is why it makes a difference using a recognized real estate auction company to ensure the auction process is effective. Fortna Auctioneers & Marketing Group, the premier residential and commercial real estate auctioneer firm in the nation, can help plan and manage the entire auction process, from planning through closing. Fortna Auctioneers & Marketing Group will develop a personalized ad campaign, locating all potential buyers and bringing them to one location to bid competitively for your property. Our innovative strategies will help get the best price possible. With a 99% success rate when it comes to closing residential and commercial real estate auctions, Fortna Auctioneers & Marketing Group remains committed to total customer satisfaction. In addition to a successful auction, you’ll also get a free first meeting consultation detailing the auction process from start to finish. With more than 40 years of marketplace experience, Fortna Auctioneers & Marketing Group can give you the competitive edge you need, whether your property is a luxury home, commercial building, industrial site, condo, business liquidation, hotels, golf course, resorts, undeveloped land, etc. Contact us today.